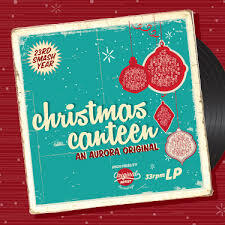 The cast and crew of the Aurora has camped up their Christmas Canteen work, which has become a seasonal standard for them. Brandon O’Dell scripted this one, which is co-directed by Anthony Rodriguez and Ricardo Aponte, who also did the terrific choreography. Ann-Carol Pence was onstage with the band and even got to belt out a number towards the end of the show. A cast of ten singers/dancers/actors run through 40 numbers with such great aplomb. You will want to sing along, and that isn’t a problem if you don’t get too loud. In Act II, some members of the audience get called to stage to help going through the Twelve Days of Christmas. The set is delightful, with stars and snow falling into the trees behind the house, while they dress up the area with trees and other seasonal paraphernalia. And it is a tradition that they do a salute to our military families with the medley of armed forces anthems.